It is with a heavy heart that I take up my pen to write these the last words in which I shall ever record the singular gifts by which my friend Mr. Sherlock Holmes was distinguished. In an incoherent and, as I deeply feel, an entirely inadequate fashion, I have endeavored to give some account of my strange experiences in his company from the chance which first brought us together at the period of the “Study in Scarlet,” up to the time of his interference in the matter of the “Naval Treaty”–an interference which had the unquestionable effect of preventing a serious international complication. It was my intention to have stopped there, and to have said nothing of that event which has created a void in my life which the lapse of two years has done little to fill. The Final Problem was published in 1893 and was meant to be ACD’s last Holmes story. The author had grown tired of the Consulting Detective taking up all of his focus as a professional author, and tried to free up his time and his mind for more worthy projects. At least, ACD created a fitting final appearance for Holmes. He goes out in style. The reason for this is that Holmes has met his match. In trying to expose Professor Moriarty, Holmes exhausts himself bringing down his organisation bit by bit, and at the same Holmes time is being hunted. That letter gets me every time. ACD could hardly have chosen a more dramatic ending to the series at the high time of Holmes’ success. How shocking it must have been to read this story as a follower of the series at the time it was written, at a time when this really did seem like the end for Holmes and Watson. Of course, we now know that there are more stories, but at the time, the public reaction to this story was so strong that ACD was eventually persuaded to continue the series after all. “‘ You evidently don’t know me,’ said he. “‘ All that I have to say has already crossed your mind,’ said he. “‘ Then possibly my answer has crossed yours,’ I replied. To me this is one of the most beautiful depictions of the duality of the human mind/spirit/whatever. It’s the Jekyll/Hide, the ultimate light/dark side stand-off, and it is happening in a sitting room. While the focus of this story is often described as the altercation at the Reichenbach Falls, the more interesting challenge is fought at the first face off where Holmes and Moriarty could almost be two sides of the same coin – they would even complete each other’s sentences except they don’t even need to exchange statements at all because they already know what the other is thinking! To me this is one of the great scenes in the canon. 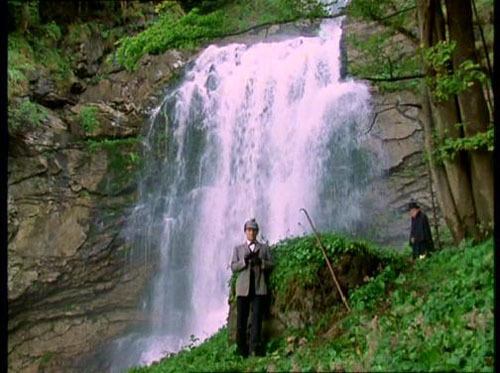 I also love that he chose the Reichenbach Falls as the setting. However, it is a choice of location that in my reading may also carry a more personal connection for the author. I’ll need to resort to another ACD biography for back-up but from the horrible one I finished last week (Andrew Norman’s Arthur Conan Doyle: Beyond Sherlock Holmes) it appears that the trip to Switzerland was an ad hoc trip on account of his wife having been diagnosed with tuberculosis. Like so many other sufferers, they believed that the Alpine air was a cure for the illness, and they stayed for quite some time (I believe she also returned there), but to no avail. She eventually died from tuberculosis a few years later. So when reading this story, I was wondering of course if ACD, with his medical knowledge, had some inkling about whether his wife would recover. No antibiotics at the time meant that 50-60% of TB patients died within 5 years. In many ways, The Final Problem is one of the saddest stories in the canon but also one of the most beautiful because it shows off so much about the human side of the characters, their friendship, their failings, their vulnerability. Of all of the stories, this one haunts the fictional world of 221 Baker Street like no other.